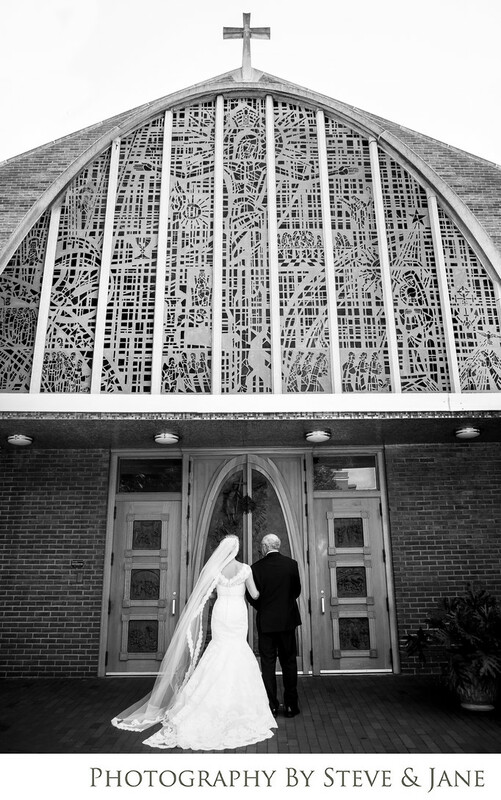 This summer wedding ceremony occurred at St. Stephen The Martyr in Washington DC. St. Stephen the Martyr is a beautiful modern Catholic Church located in the DC Metro Area. St. Stephen The Martyr has a unique history. It was the church that John F. Kennedy attended while was the president in the 1960's. This church has a unique interior. It marries beautiful stained glass windows and smooth white walls that are reminiscent of south western interiors. This couple chose to have a traditional catholic wedding ceremony along with mass for their vows. The solemn and hauntingly beautiful liturgy gave a sense of seriousness to the promises they were making to each other. Interspersed with beautiful music and the eucharist, their guests partook in the sacred traditions of the catholic saints. After their ceremony, the couple took a shuttle to the Netherlands Carillon for some wedding party and couples portraits. The carillon has some of the best views of the Washington D.C. skyline and is located next to the Marine Corps Memorial. the Carillon is a must quieter option for portraits instead of the Lincoln or Jefferson Memorial with it's throngs of tourists milling about in the background of your wedding day photos. Location: 2436 Pennsylvania Ave,, Washington, DC 20037.